Photographic plates going back to 1890 are providing new clues as to whether a distant exoplanet has a giant ring system, more than 100 times wider than Saturn’s. Artist’s concept of how large the rings of exoplanet J1407b would appear in our sky, if they were placed around Saturn. For comparison, notice the crescent moon on the right side of the image. Image via M. Kenworthy/Leiden University. Rings around space bodies in our solar system are common. Saturn is perhaps best-known for its majestic ring system. Jupiter, Uranus and Neptune all have rings as well. Even an asteroid – 10199 Chariklo – was found, in 2014, to have its own rings. But what about planets in other solar systems? As astronomers have found, giant planets are also common around other stars. It would stand to reason that some of those exoplanets should have rings. Detecting them wouldn’t be easy, since the planets are so far away and only are recently themselves detectable by modern technologies. But this month (October 15, 2018) astronomers said they’re now closer to determining if one particular candidate planet – orbiting the star J1407 – really does have rings, or not. J1407 is a sun like star, 460 light- years from Earth, in the direction of our constellation Centaurus. The star is only about 16 million years old, a baby in astronomical terms. In 2007, the star exhibited an odd series of eclipses that researchers said might be caused by a planet with a giant ring system. They labeled the planet J1407b. If it exists, and if it does have rings, this planet’s ring system would be more than 100 times wider in expanse than Saturn’s. J1407 hasn’t undergone an eclipse since 2007. Astronomers said this month they’ve now performed a new analysis of hundreds of photographic plates acquired between 1890 and 2007, and that analysis showed no other eclipses, either. Robin Mentel at Leiden University led the new research, which is published in the peer-reviewed journal Astronomy and Astrophysics. Old photographic plate from June 28, 1948, showing the star J1407 (circled in green), along with three other reference stars. Image via R. T. Mentel et al. The idea that a planet with giant rings might be responsible for the eclipses was first proposed by Matthew Kenworthy and other researchers in 2015. In 2016, their work showed that the rings would need to move against the orbital direction of the planet in order to remain stable. No more eclipses were found in the plates between 1890 and 2007, but, these astronomers say, that doesn’t mean the planet, or its rings, don’t exist. They said it’s possible they missed an eclipse, since there are gaps in the data. Or maybe – if no eclipse took place – that negative finding helps narrow down the possible planet’s distance from its star and the length of its orbit. If the planet really is there, Mentel and his colleagues said, the team’s calculation show that the next eclipse of the star should occur in either 2021 or 2024. Mentel studied 490 photographic plates that had J1407 on them, the oldest being the Harvard DASCH survey from 1890. He compared the brightness of the star with two other equally bright stars close by. 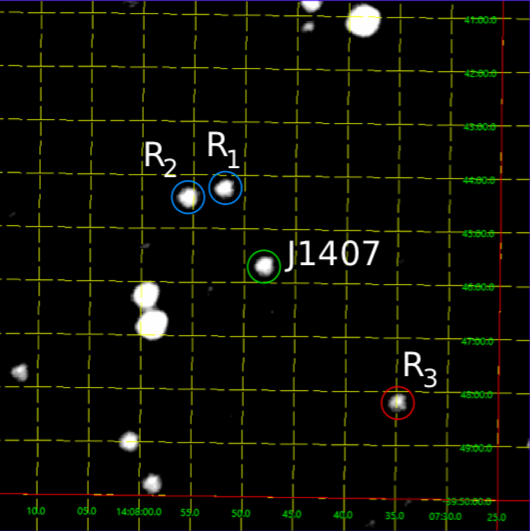 If the star J1407 was obscured at some point, it would appear to be fainter than the two nearby stars. As it turned out, Mentel did not detect any eclipses, even after he compared J1407 with a third star that was just as dim as an eclipsing J1407. Artist’s concept of the possible giant ring system around the planet J1407b. Image via Ron Miller. The details that we see in the light curve are incredible. The eclipse lasted several weeks, but you see rapid changes on time scales tens of minutes as a result of fine structures in the rings. The star is too far away to take immediate rings true, but we could based on the rapid brightness variations in the star light make a model of the ring system. 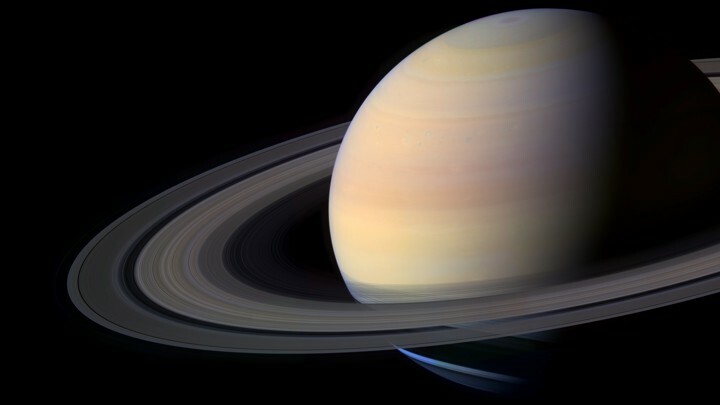 If we put the rings around Saturn, we could at night seen from Earth, many times larger than the full moon. There is probably at least a ground mass of material in the rings present, and more material may be in the satellites that provide the substructure of the ring. Saturn with its majestic ring system. Image via NASA. One obvious explanation is that a moon formed in this place, just as the holes are caused in Saturn’s ring structure by the moons. If the rings are confirmed, they suggest that ring systems – like giant planets – are common in our Milky Way galaxy, including some systems that would dwarf Saturn’s rings. With astronomers now estimating billions of exoplanets in our galaxy alone, there could be many ringed worlds out there! Bottom line: Whether J1407 actually has a planet with giant rings still isn’t known for sure, but astronomers are getting closer to an answer. Confirmation may have to wait until 2021 or 2024, when, astronomers calculate, another eclipse of the host star by the ring system might occur.